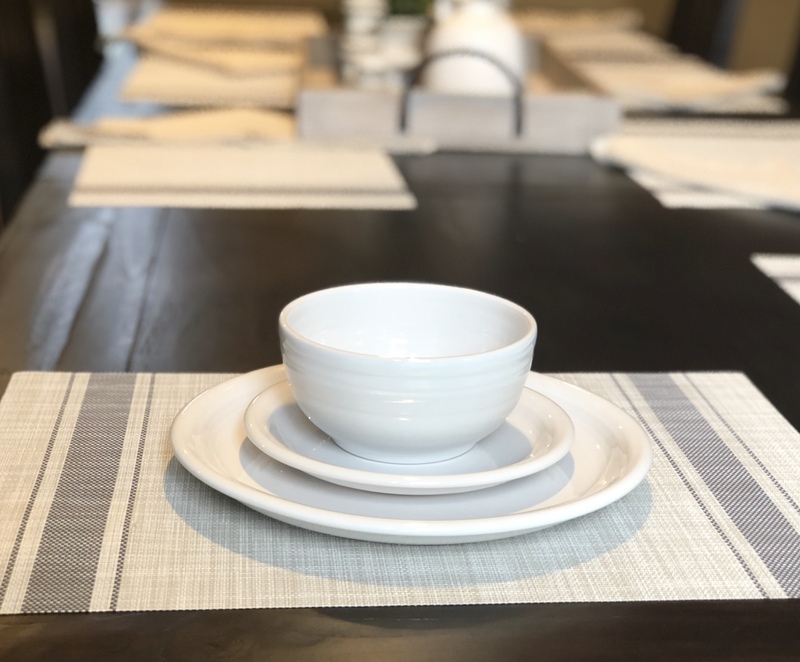 Ok, let’s talk tableware. I know Fiesta has been around forever (1936! ), but just a few months ago we “discovered” it and realized it would be a great switch for us. 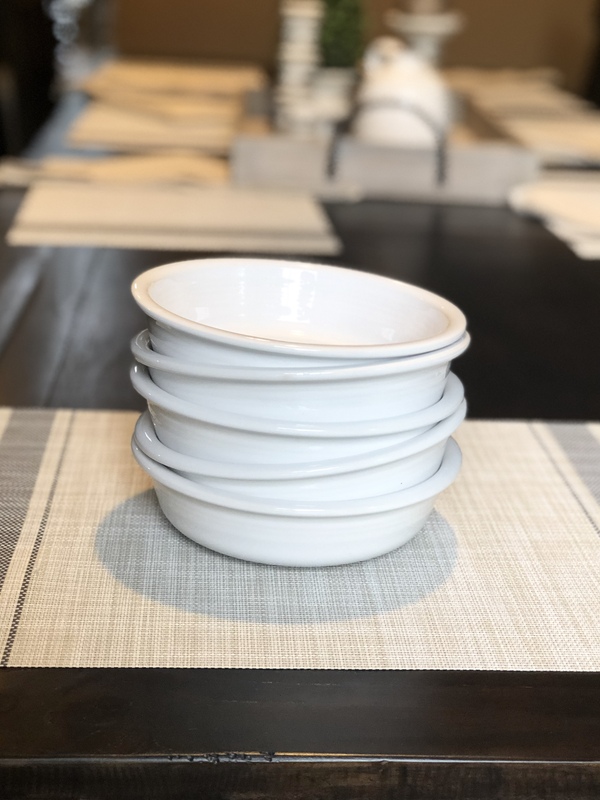 We loved our all-white Martha Stewart set, but after 5 years several bowls had chipped. 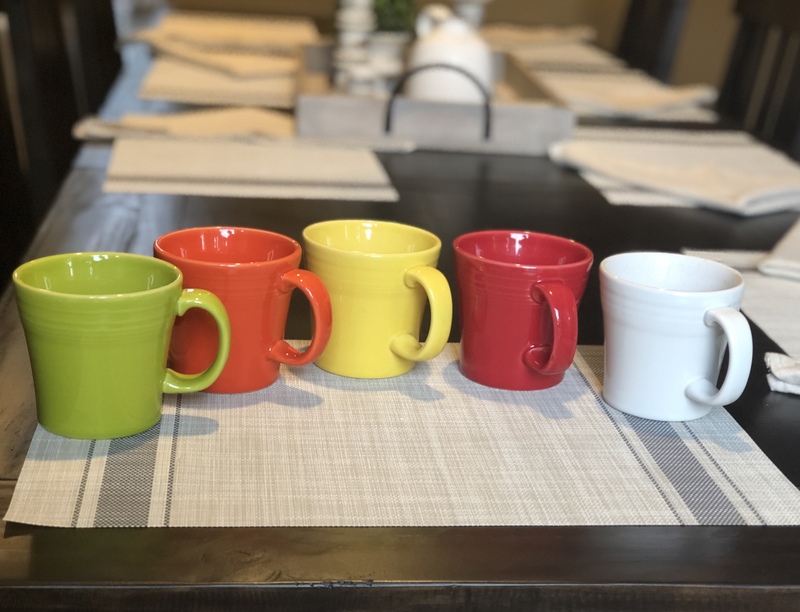 We loved our mix and match hodgepodge of mugs (and my habit of buying a “wish you were here” Starbucks mug at every airport we went to ever), but were ready for something a little more high quality (read: made in America) and aesthetically pleasing. 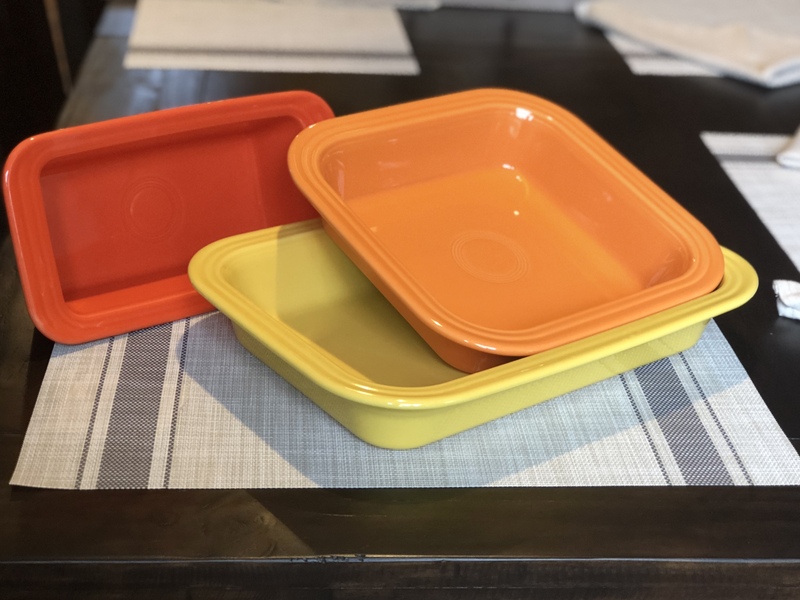 Fiestaware fit the bill! 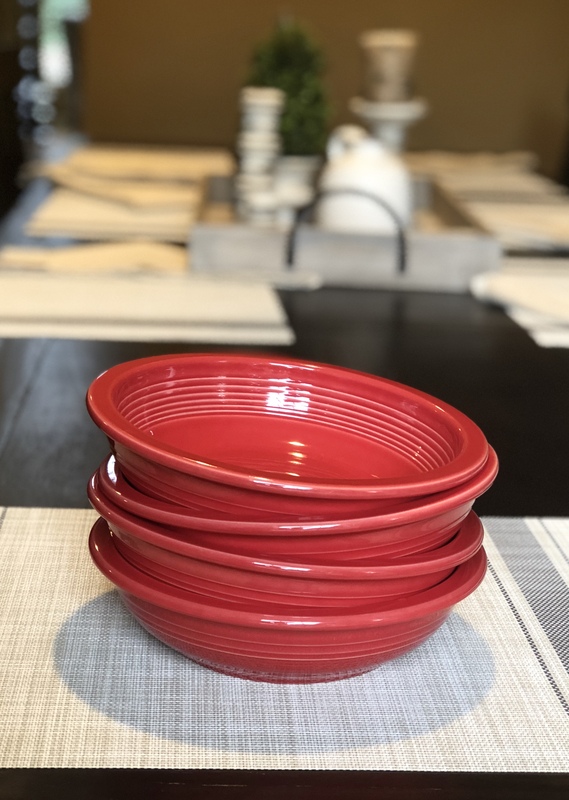 It was relatively inexpensive to replace our plates and bowls, etc. And the beauty about Fiesta is the colors are meant to mix and match. If something breaks, you can easily replace it! They say their dinnerware “doesn’t take itself too seriously” and that pretty much hits the nail on the head. Fiesta is sturdy, classic, and not too fancy (hence, great for everyday use.) We bought some through Fiesta factory direct and some through Macy’s – right now Macy’s is having a great sale so I thought I’d share our haul! Love the tapered mug as opposed to the smaller ones with the little ring hole. You can put all four fingers in the handle and drink that way, and they’re a great size, 15 oz. Perfect for a 12 oz k-cup plus a splash of milk if that’s your cup of tea! …er, coffee. (Jason and I used to drink a whole pot together but I have dialed the caffeine waaay back due to the pregnancy). We wavered about whether these would actually be useful in our home, but I am so glad we went with them! I use them of course for pasta dishes, but also for breakfast egg/veggie scrambles etc. They’re a great size and shape! Ok, so maybe I was a pansy with these as I stuck with white, but they’re beautiful and durable! 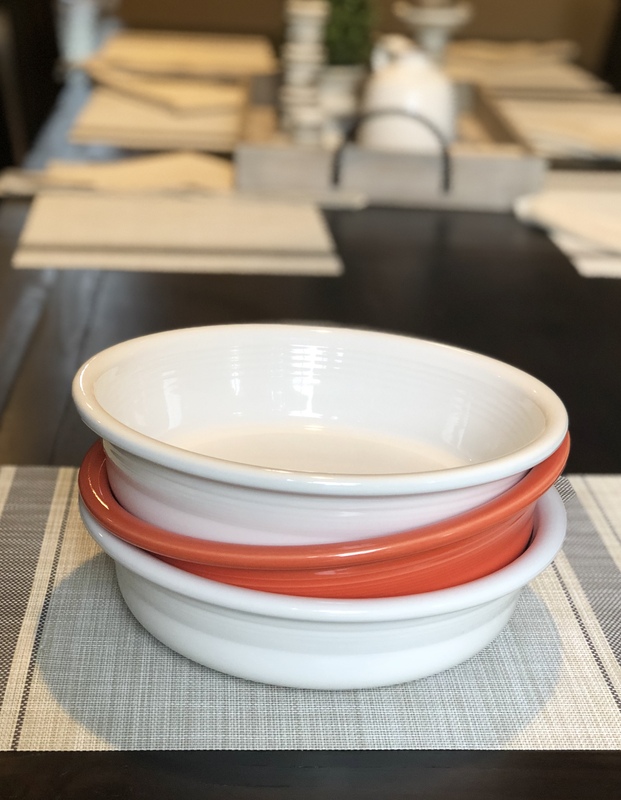 We have this set of the small bistro bowl, and small and large dinner plates. We also bought a set of the 19 oz medium bowls. These serving bowls give me LIFE! Great for a spread of finger snacks like chips and popcorn. Might just whip up a 7 layer dip this weekend!! As you can see, we mostly opted for the warm colors, but as years go on and we continue to build our collection I’d love to add the purples and blues etc. The great thing about Fiesta is you can always add to your collection when you need to! Now if you’ll excuse me, this banana bread recipe is calling my name.